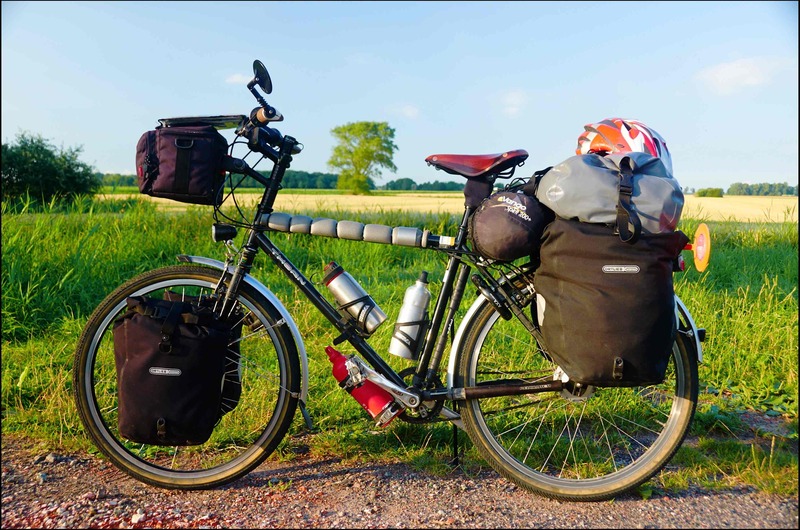 The Thorn Raven Tour is an ‘Expedition‘ touring bike. 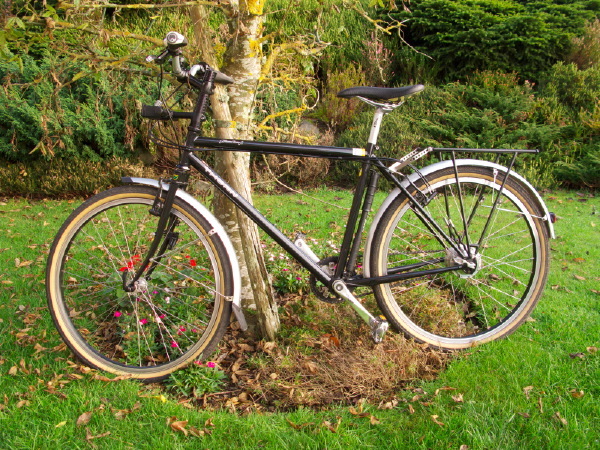 It was obtained second hand from Thorn Cycles who design them in Bridgwater, Somerset. I christened it ‘Torla’. The information that follows gives the specifications of the bike when it arrived. Since then there have been some changes to the bike. Not wanting to get too hung up on the technical bits, but I did pass some cold snowy winter evenings making changes to the bike. The original specs are listed, and where scored out, their immediate replacement parts. Additions to the bike and 2016 updates are shown at the bottom of the page. + Added protective tubing on front and rear racks. Details here. ‘Torla’ fully loaded and on tour. This picture was taken in north-west Germany while cycling the North Sea Cycle Route in summer 2013. + Ortlieb Ultimate 6 Plus. Prior to the 2016 Summer trip from Scotland to Istanbul, I replaced the Rixen & Kaul Daypack Box handlebar bag with an Ortlieb Ultimate 6 Plus bag. Slightly larger and very waterproof, it is also a bit lighter. + Schmidt Son 28 Klassik. The Busch + Müller Dymotec 6 Dynamo was replaced before the tour with a Schmidt Son 28 Klassik front hub dynamo. This model is actually discontinued but at the time of writing (January 2017) SJS Cycles still have them in stock. When the new wheel was built I chose the Rigida Andra 30 CSS version reputed to be longer lived with it’s carbide impregnated brake surface. So far so good! Reports later after extended use. + AXA Solid Plus Wheel Lock. The AXA Defender wheel lock was replaced before the tour with the AXA Solid Plus wheel lock. This new lock has more clearance from the tyre and should allow a good level of clearance if 2 inch tyres are fitted in future. + AXA Blueline 50 Front Dynamo Light. On this tour I somehow managed to break the Busch + Müller Lumotec IQ Cyo R Senso Plus LED Front Light 175QRSNDi near Dusseldorf. A local bike shop did not have a replacement to I fitted the AXA Blueline 50 Switch as that was the only quality front dynamo light the shop had in stock. It is slightly brighter but lacks the auto on/off function of the Busch + Müller light it replaced. There is no stand-light with the new AXA light so it goes off when you come to a stop. A little annoying. There is another version available with the stand light feature so I may upgrade at some point in the future. + MKS Sylvan Prime Touring Pedals and Powergrip Pedal Straps. During this years tour I converted to using Keen Commuter bike sandals without SPD clips. I found them really excellent on and off the bike in the 10 Deg C to 35 Deg C conditions found during a continental European Summer. The Shimano SPD M324 pedals however were a little small and I found that at times my feet would slip off the pedals in wet conditions. 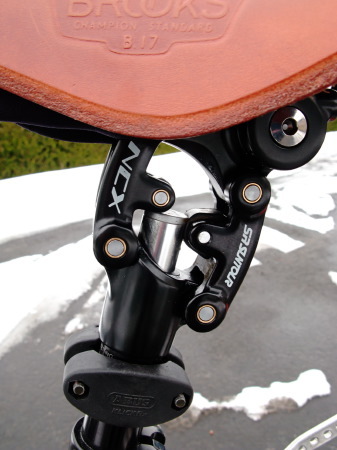 On return I hunted for a better solution and fitted MKS Prime Sylvan Touring pedals and Powergrip pedal staps. The wider pedals and grip straps are working much better for me with the Keen sandals. + SKS Bluemels 60mm Mudguards. 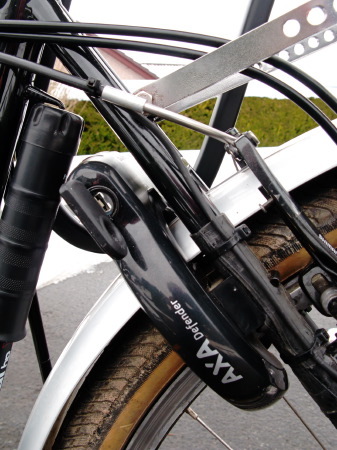 The SKS Chromoplastic mudguards have been fitted to the bike for at least seven years. They were showing some small cracks at the attachment points even five years ago. With the North Sea Cycle route and the Scotland to Istanbul trip this Summer, they were ready to be replaced with a set of SKS Bluemels 60mm Black. The bike now has a more ‘stealth black’ appearance. I’ve got a Suntour NCX-12 seatpost on my bike and I love it. I just ordered a Brooks B17 S (women’s) saddle. I read somewhere that the Brooks B17 saddle will NOT fit on a Suntour NCX-12 seatpost and I started doing Google searches. Got to your page and there’s a picture of your Brooks Select on the very same suspension seat post I already own. Did you have any problems with the fit? Is there any difference in rail size between a Brooks B17 Select and a Brooks B17 S classic? The one I ordered is not the “select” model. 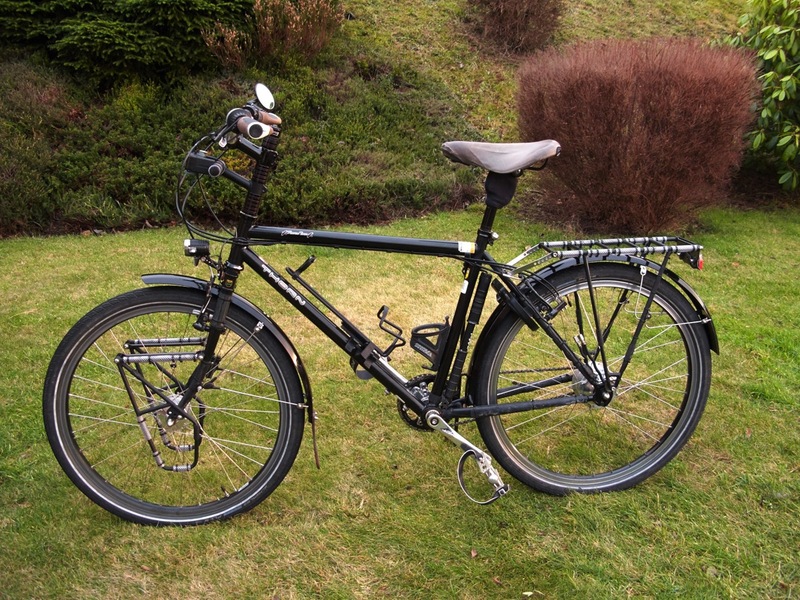 Hi could you send me some information on the raven thorn touring bike . Thank you Mark nightingale 2707 2nd street moline Illinois 61265 USA tele 1 309 269 7153. Its a tight fit with the Suntour NCX-12 suspension post but does just fit as described in my article with the B17 Select. Not sure about the B17S model as I don’t know if the rails are different. Maybe you could drop an email to Brooks asking for the dimensions and differences in the saddle rails. I don’t have any info to send but Thorn themselves can answer all your questions and can provide brochures for all their current models. You can download PDF files for each model as well as the ‘Mega-Brochure’ which makes for very interesting reading! You will not be unhappy with a Thorn – they are really well made touring bikes! 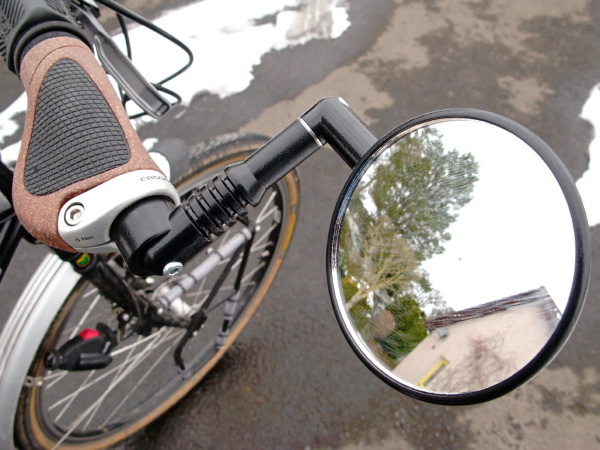 Did you have any problems fitting the mirror with the Ergon Grips fitted? I’ve got Ergon GP1 grips and would like to fit a Zefal Spin Mirror. Hi Steve! No, the MOUNTAIN MIRRYCLE mirror fits the standard handlebar size. No problems with the Ergon GP1 grips! Beautiful bike. 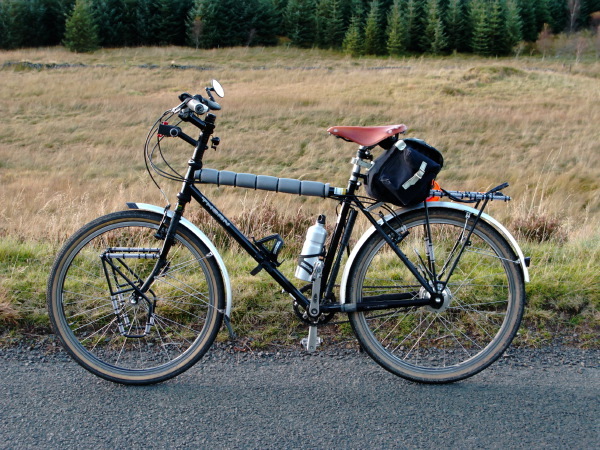 I have the same model, which I rode from London to Hong Kong in 2009 (humphreywilson.blogspot.com). Love the hose on the carriers – I used electrical insulation tape which just rubbed through and now they’re bare metal (duh). Love the foam on the top tube. .. I used gaffer tape which actually worked well. My bike is in the Colossi factory at the moment (in Shenzhen, China) having the down tube replaced after it sheared following what can only be described as an ALMIGHTY tumble 2 yeas ago. Thorn advised chuck it and get a new one (lifetime warranty doesn’t cover tumbles!) but it has too much sentimental value and I’m itching to ride it again without the metal splints which have been holding it together for 2 years. Actually, even splinted, I rode it from Tokyo to Wakkanai (the very north) and the length of Taiwan. Advantage of steel is that this can be done. I discovered the problem in Southern Malaysia (first symptom was a strange creaking noise), a roadside welder was 300 away and then I was off again! His work just got me up to Phuket! Worth mentioning is that if you’re ever on a long tour, decant the rohloff oil – the plastic bottles they come in LEAK and you don’t want to run out of this stuff. It caused issues for my hub because I couldn’t change. It still functioned but with a clicking noise. I came clean to Rohloff what happened (via Thorn) – they fixed it for free. Been riding an aluminium road bike with rear carrier for the past year which I’m told has badly affected my back…time to get the Raven Tour back in order, with a suspension seat post like you. Good to note that the seatpost is 27mm because I really thought mine was 25mm when I measured it the other day. Living in HK, I need to sharpish order the seatpost for my next ride in 2 weeks and can’t re-measure right now because the bike isn’t here! Thorn told me 27mm but I didnt believe them…You’ve saved me! I echo what you say, if you can afford it, a Thorn will never let you down. I tell everyone to get one! Great wheels too. If you get this? We enjoyed the walk this afternoon In Cademuir Did not know you were bike expert! Enjoyed the chat today with you and Lucyna. Trek 7300 is a great bike. As I said steel frames I think are best for touring. You could load up your Trek though with some racks and luggage and do a Scotland tour (with the trailer for the dogs!). Great way to travel. Cheers Richard.